I’m on a regular quest to improve my soil. My latest inquiry has been into BIOCHAR! I like to say it all dramatic like that because it’s a modern sounding name for something that has been around since… Adam. But I have to admit that BIOCHAR! sounds a lot more intriguing than BURNT WOOD! Just doesn’t have quite the same ‘ring’ does it. 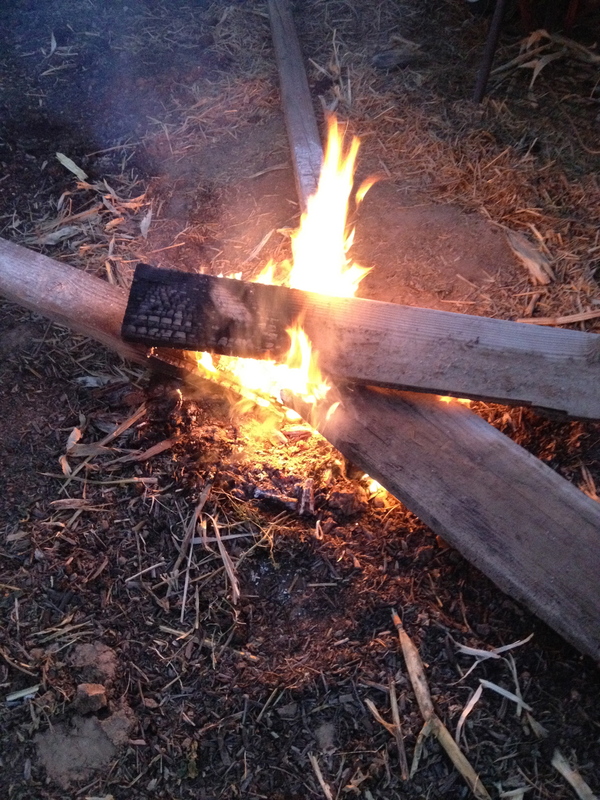 Biochar is normally made by burning wood in a low oxygen environment. This serves to produce a very fine and clean charred wood. From what I’ve researched, this method for creating the biochar cleans up the pores in the wood by burning off excess debris and sap. What is left over is black char that is very brittle. In order to create this “low oxygen” environment you need a chamber that limits airflow. There are numerous ways to create these chambers, but… yah, I’m not going to do that. The main goal (from what I can tell) has less of an impact on the biochar than it does the environment. The low oxygen environment creates a situation where more of the gases from the wood are consumed, giving off less pollutants. At least that’s what it seems like; quite frankly I’ve found very few sites that clearly define WHY you want the low oxygen environment. I’m not building a special oven. I’ve got excess, rotting wood, my waste company won’t collect it, it harbors bugs and makes a mess so I’ve got to get rid of it, so I’m burning it either way. I might as well do some experimenting while I’m at it and not waste, what could possibly be, a valuable resource. 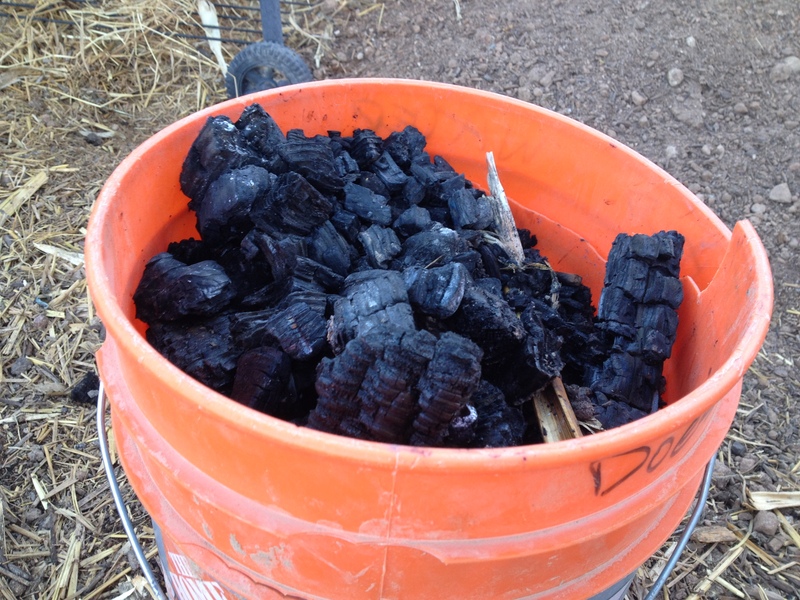 Biochar acts like a sponge and holds moisture, something that is worth its weight in gold in AZ where the temps are not only high, but the humidity level frequently dips into the single digits. It does other things too like creating an environment for different types of microbes and such, sequesters carbon out of the atmosphere for long periods of time, and holds nutrients. But quite frankly I’m mainly interested in the moisture aspect. As I was burning my first batch of wood I tried to keep an eye on the condition of the wood. Normally during camping I just let the wood burn down to ash. Ash is not what I’m going for here. So as the wood was burning I pulled out the pieces that had turned to charcoal and hosed them down until they had stopped smoldering. I broke up the pieces and put them in a bucket. I’ll take my manual tamper and bust them up some more until they are small gravel sized pieces. I plan on taking one bed of my main garden area and spreading at least a five gallon bucket of the BIOCHAR! over that area and mixing it into the compost that is already there. I’ll plant what I had already planned in that area and observe the differences. This entry was posted in BIOCHAR and tagged Biochar. Bookmark the permalink. 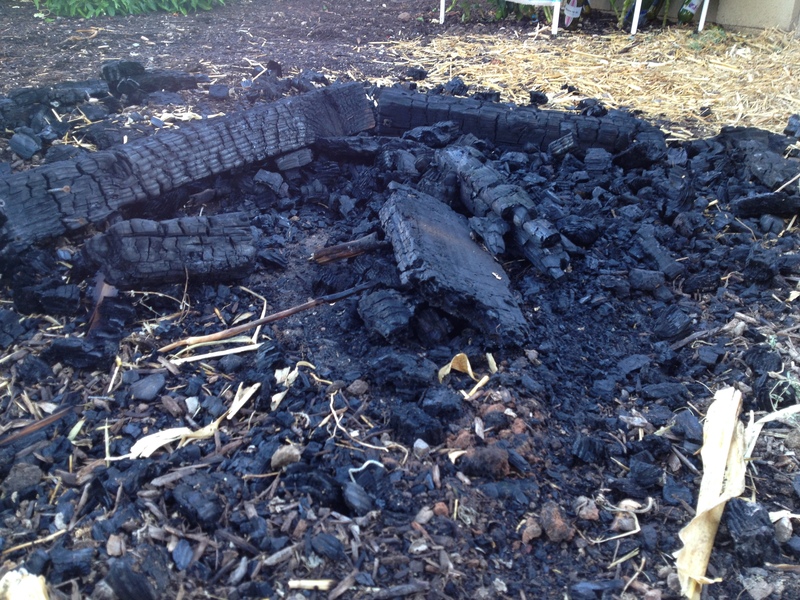 Sounds good yes 🙂 anything you can do to help your soil works regardless – technically charcoal briquettes are biochar – so if you had nothing to burn you could make that work. Keep in mind the ashes from your fire pit can go in as well if you need a ph amendment. I’m into biochar too. They way I got them is quite different. Through the winter I have to get the fire started in the log burner. Before I go to sleep, I fill the log burner full of wood and turn the vent down to minimal. In the morning, I get charcoal. If I turn the vent on max, everything will burn down to ash. However, I notice it only works with wood from stonefruit trees, especially cherry wood. Gum wood burns too clean and not much residue remains, I do still get some charcoal left from Oregon. They go out into garden as mulch under the fruit trees. Thanks, I appreciate that! I always love getting a laugh. Sounds interesting. I’ll be waiting to read how it does. Thanks! We’ll see. I’m hopeful. Hey Keith, I’ve heard of the biochar but sounds like too much time consuming work for me. I’ve heard of a method called hugelkultur. Basically, wood is just buried in the ground making a raised bed. One year of resting to allow for the decomposition to begin. It’s supposed to increase water retention and slow release nutrients for years to come. I haven’t had time to try it yet but plan on giving it a try in the future to see if it really works. Have a great biochar day. I’ve heard of hugelkultur but read lots if different opinions on it. The ones that seemed the most knowledgable said to make the mound as tall as the person building it. I’m six feet tall. Number one that’s a lot of wood that is a little hard to come by in our desert. Number two, that would be less than appealing to my HOA, especially since we have a “view fence” on our back that is less than five feet tall. I love the thought though. I was thinking that if I lived in the northern part of the state I would definitely try that. Thanks, Dave! Thanks for your tips on creating the biochar. I’m starting a small hugelkultur bed that will be about 3 feet tall. Since the wood will create a carbon rich environment, I’ll be planting Austrian winter peas in it for this first winter to help add some nitrogen. It will be placed next to the chicken run so I’ll use the pea plants for both my salads and for chicken forage. I’ll be looking forward to how the hugelkultur bed holds moisture in our Mediterranean climate in the summer (dry and hot, but not as hot as your spot! ).